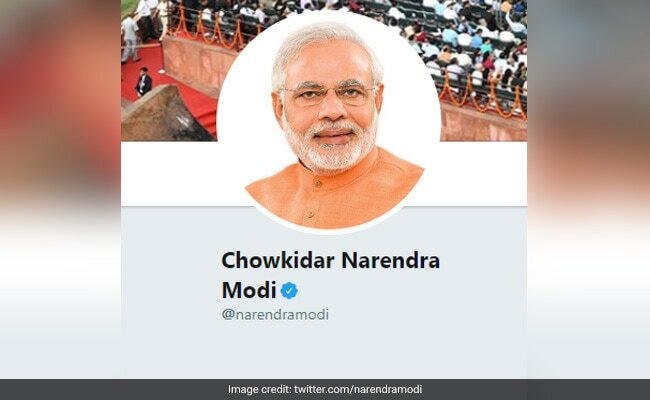 Prime Minister Narendra Modi's use of the prefix "Chowkidar" on his twitter handle has created a storm on both sides of the political divide. The "Main Bhi Chowkidar" movement has been a huge success and on March 31, Prime Minister Narendra Modi would interact with 25 lakh newly minted chowkidars through video conference, Union Minister Ravi Shankar Prasad told reporters today. The "Main Bhi Chowkidar" campaign had taken social media by storm, the minister said. With the hashtag being tweeted 20 lakh times and 1,680 crore impressions, it has become a "people's movement", he added. The Prime Minister's use of the prefix "Chowkidar" on his twitter handle has created a storm on both sides of the political divide. While his ministers, party leaders and supporters rushed to get on board, the opposition hastened to disparage it. From Congress chief Rahul Gandhi and his sister Priyanka Gandhi Vadra to Trinamool Congress leader Derek O'Brien and Samajwadi chief Akhilesh Yadav, all poured scorn on the campaign. It even triggered a counter-campaign from Hardik Patel -- the newest Congress entrant who made headlines for spearheading the quota stir of the Patidar community. Mr Patel used the prefix "Berojgar" (unemployed) -- which gained traction quickly on Twitter. This morning, irked by the Congress campaign, a Haryana's BJP minister Anil Vij took a swipe, saying if the party did not like the prefix Chowkidar, "You too prefix #Pappu before your names. We won't mind that". Over the last year, "Chowkidar chor hai (the watchman is a thief)," has been Rahul Gandhi's slogan to hammer in the party's claim that PM Modi had been involved in corruption and crony capitalism in the Rafale fighter jet deal. At the end of Day One, PM Modi tweeted: "Fellow Indians, Happy that #MainBhiChowkidar has ignited the Chowkidar within all of us. Great fervour! Ecstatic to see the passion and commitment to protect India from corrupt, criminal and anti-social elements. Let us keep working together for a developed India."